The Columbia Wrightsville Bridge is the world's longest concrete multiple-arch bridge, according to Wikipedia. It was built in 1929. 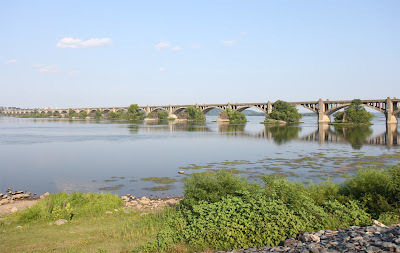 It wasn't the first bridge to cross the Susquehanna at that location, and I dare say it won't be the last, though this one will probably be around for ages to come. 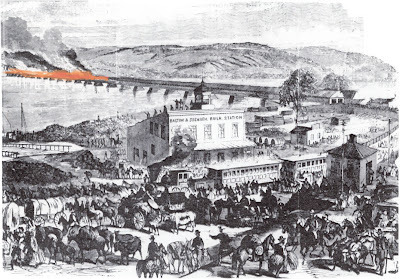 And while it's true that Early had a notion to secure the bridge in case of a possible attack on Harrisburg, that never came about, and it's most likely that he would have burned it in due time. (One wonders what would have happened if he had crossed over and then lost the bridge.) It's all summed up in one good sentence at the Wiki, "Confederate generals Jubal A. Early and John B. Gordon had originally planned to save the bridge despite orders from General Robert E. Lee to burn it, and Union forces under the command of Colonel Jacob G. Frick had burned the bridge, originally hoping to defend and save it." However, it's been my experience that the locals don't look kindly on any historical interpretation that detracts from the actions of their forebears, so you may want to avoid the topic when visiting. You can read about it in the Official Records of the War of the Rebellion here, it covers Early's report of the entire campaign, so you have to skip ahead to find the bridge story. Comparing the Union & Confederate reports of "the battle" makes for good reading, especially if you have a sense of humor about such things. Anyway, today's bridge is quite a thing to see and there's plenty of public space on either side of the river to see it from. If you're taking pictures, the sun is over Columbia in the morning and Wrightsville in the afternoon.